Lord Subramanya, the ‘ishta-devata’ of most Tamils resides on the top of Palani hill, according to Hindu mythology. A small agricultural town at the foot-hills of the western ghats, on the leeward side, it is a famous place of pilgrimage right round the year. Although technology seems to have caught up with Palani recently by means of a rope-way up the hill and a motorable road to Kodaikkanal, people are still quite old fashioned and tradition-bound – one can still see a large number of bullock carts in Palani in the 21st century! But a pleasant smell about the place greets a traveller entering Palani – a smell of flowers, vibhuti, incense and even a whiff of the famous panchamrutam, the exquisite concoction of fruits, honey and jaggery. And there is the sound of music too – not merely nadaswaram and tavil but – vocal, string and percussion instruments. Palani cannot be compared to centres of music like Thanjavur, Pudukkottai, Ramanathapuram etc. but the Palani temple and its environs have kept the town buzzing with musical activity fostered by generations of vidwans assigned to the temple and secular duties. As is usual with famous temples, Nadaswaram and Tavil artists have held sway over centuries and a great Tavil vidwan, Muthaiah Pillai by name lived there from the closing decades of the nineteenth century. He had traveled all the way to Pudukkottai to do ‘gurukulavasam’ with the legendary laya vidwan, Manpoondia Pillai. At a fairly early stage of his career, he seems to have given up playing Tavil and instead, chosen to play the mridangam and kanjira. Muthaiah Pillai married Unnamalai Ammal of Chennimalai, another important Subramanya sthala nearby and had two sons, Nageswaran and Subramanyam by her. 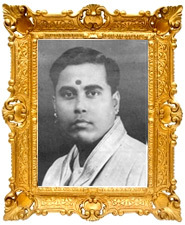 Subramanyam was born on 20.4.1908. She seems to have died soon after Subramanyam’s birth and Muthaiah Pillai married again and had a son Soundarapandian by his second wife. Muthaiah Pillai was no doubt a great laya vidwan but he was short tempered and domineering and somehow did not take to young Subramanyam with filial affection. Subramanyam was by nature left handed – a southpaw – and although there were left handed tavil vidwans by the dozen, a left handed mridangam vidwan was virtually unknown; such was the blind prejudice prevailing in those days! All attention of Muthaiah Pillai was bestowed on Soundarapandian who however was not talented. Young Subramanyam (Palani to us henceforth) was born in this world to play the mridangam as no one ever did, and he was not put off by his father’s indifference. He practiced on the sly what his father taught Soundarapandian and in spite of the hostility at home (his step mother, as in most anecdotes, did not treat him with love and kindness), progressed rapidly in absorbing the art. Pudukkottai Dakshinamurthy Pillai, a co-disciple of Muthaiah Pillai under Manpoondia Pillai, heard Palani practicing in his father’s absence and spoke harshly to Muthaiah Pillai about his neglect of his talented son, Palani. Properly chastised by his friend, Muthaiah Pillai started teaching Palani at a furious pace so as to gain back lost time. His teaching methods were indeed harsh even by the standards prevailing then and even for the smallest mistake he did not spare the rod. But this intensive coaching did do a lot of good to young Palani and prepared him very well to meet future challenges in his illustrious career. Powered by Ventech Solutions. © 2008 Palani Subramania Pillai.